Last week, the Scottish budget was approved in Parliament. Among many other benefits, it provided funding for Councils to ensure care workers receive the living wage. In our area, the higher than average cost of living causes real difficulty for workers on low incomes. It’s right that people providing such a valuable service to support other people in our society are paid appropriately. It also included an investment of £115m in rural broadband, something I know from listening to constituents is a problem that urgently needs to be tackled. In our modern society, being connected is no longer an extravagance, it’s a necessity, and I’m glad to be able to support these improvements. I’ve had a few complaints from constituents about noise and disruption caused by AWPR works. I have taken up the issues with Transport Scotland, who have assured me that they are working hard to address any problems. 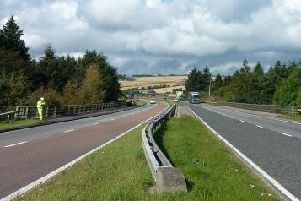 Police Scotland have recently asked drivers to be mindful of their speed at AWPR roadworks, after some folk have been driving well above the temporary speed limits. Short term delays are always frustrating, but it’s important to remember that in the long term the project will improve journey times. Restrictions are in place for the safety of both drivers and workers, and dangerous driving will only risk accidents for everyone. This week I was delighted to visit Entier, an Aberdeenshire catering business, for Modern Apprentice Week, and to present some apprentices with their hard earned SVQs. It’s great to see local businesses investing in young people, and supporting high quality jobs in our area. It’s not always easy to see the direct impact of political discussions on our lives. After voting to increase the number of modern apprentices in the budget, then meeting successful trainees a few days later, I’m proud to have played my small part in providing additional great opportunities for more people in the future.